Some Things Are Just Meant To Be Together. So yesterday I made the bread pudding that converted me to bread pudding. Well, other than those dry tasteless things that call themselves bread pudding the same way Milli Vanilli called themselves singers… they are sheer imposters. A GOOD bread pudding should be moist and creamy, almost like a dense custard and overflowing with the flavors of whatever was used in it; in this, that would be cranberries and oranges… and that cinnamon I mentioned *blushes again* This is my all time favorite bread pudding and it meets all of the criteria above. It’s great still warm but it really shines when chilled. It firms up and gets oh so creamy. So go get out one of those bags of cranberries you shoved in the freezer… I have a recipe that you can use them in w/out waiting until next Thanksgiving to make cranberry sauce. You can thank me later. Warning- this is not diet food. I repeat; this is NOT diet food. Please back away from this recipe if you don’t want to gain 17 pounds in one sitting. Cover with plastic wrap and put into the fridge. After it has soaked 1 1/2 hours, remove from fridge & stir it well. Spray a 13 X 9 inch pan with cooking spray. Take pudding out of the fridge, stir well. Add cranberries and stir, mixing well. Pour half of the pudding into the prepared pan. With a spoon, put globs of the marmalade in rows up and down the pudding. (If you like marmalade, feel free to put extra; if you don’ like it at all, feel free to omit it). Carefully spoon rest of pudding into pan; it will be very full so be careful. Bake in a preheated 325 degree oven for approximately 50 to 70 minutes. Test for doneness by inserting a knife into the center of the pudding. If, when pulled out, there is no liquidy custard clinging to it and the pudding only has a very slight jiggle in the middle, it is done. Since you’re going for broke with calories with this ANYWAY, I can attest to the fact that this is fantastic served in a puddle of cream. This entry was posted in Bread Pudding, Citrus, Cranberry, Desserts and tagged bread pudding, cranberry, dessert, orange by Janet. Bookmark the permalink. I do have a weakness for custardy bread pudding and this looks like a wonderful indulgence-yum. Cranberry & orange are a great duet of flavors. Since you have focused on the non diet aspect of this I will need cut down the size of this recipe. I do not have the number of eaters at my house that you do! Great recipe, enjoy the weekend! Okay. We can talk about things that are meant to go together in a minute. First i just gotta ya that you have mentioned one of my buzz words. Or buzz phrases, in this case. BREAD PUDDING! Yes, as you said, “A GOOD bread pudding should be moist and creamy, almost like a dense custard and overflowing with the flavors of whatever was used in it…” AMEN! There’s absolutely no telling how many bread pudding recipes I have in my files. And that’s okay. At least I didn’t post every single one of them on La Belle Cuisine. Yet. I am, however, going to post this one (with your kind permission, of course). Why? Because this one is exceptional. Because this one has that mystical, magical combination of cranberry and orange flavors. Mercy! I just finished the last bite of bread pudding I made this week. Well, actually croissant pudding. With cranberries and finished with a zabaglione sauce and candied cranberries. But did I have enough? Apparently not. I could eat this right now too. The one thing I did like about the croissants beyond how wonderful the combination tasted? They do look pretty! Bread pudding with these flavors have to be amazing. I love it! Yum Yum Yum I want this now lol. Great blog check out my food blog. Mmmmmmm….this sounds amazing! My jeans are snug enough, but I still had to read and ooh and ah over this beauty! I agree, orange and cranberry are amazing together. This bread pudding is to die for! I have a bread pudding in the oven right now. I hope it turns out looking even half as good as yours does! That’s gorgeous. So bright and fresh looking. You’re right about the orange and cranberry combination being a match made in heaven. Unfortunately, I have no idea who Tai Babilonia and Randy Gardner are, but then again, I’m old. I think you did a great job of making bread pudding look pretty! 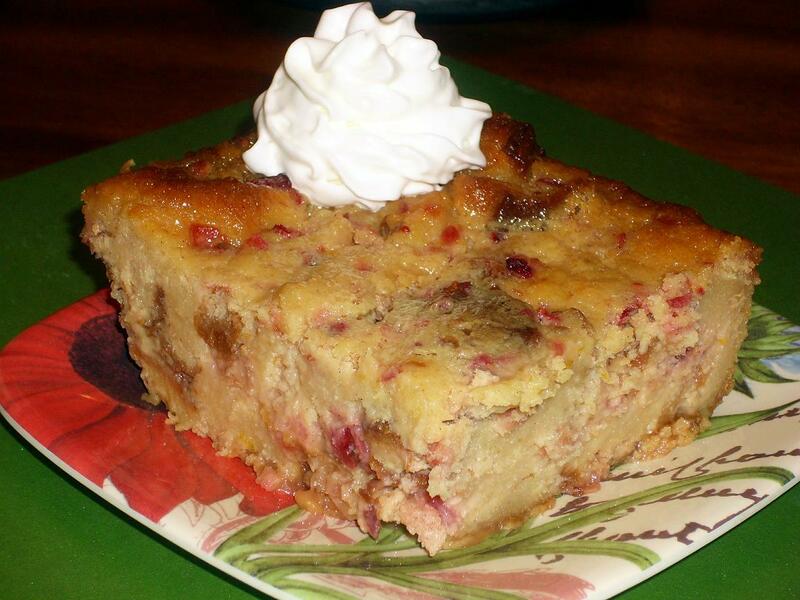 I am a lover of bread puddings from way back; I love this cranberry-orange combo. This would be perfect for the holidays! Girl this is smashing and worth the 17 pounds for sure. You know my fave is pistachios and cherries. Best couple- Lucy and Ethel, I know I know but they crack me up so I’m making allowances. I have never made a bread pudding before, but seriously think that a cranberry/orange recipe is the one to start with! I love this combination too 🙂 PS: I have a giveaway going on now that I think you might be in to! This sounds fantabulous! I am glad it is not diet food, it sounds decadent just as bread pudding should be! I love all of the orange goodness that has been added to it. Hope you had a lovely weekend :)! Bread pudding is always such a big hit in my house and I’m constantly looking for new recipes to be tried. I’ll surely try this one next. Thanks for sharing.